Our BLUSHING BRIDE is so beautiful and a top seller. 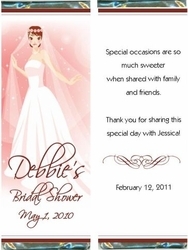 Pretty Candy Wrapper complete with a blushing bride, name and date is a fabulous font! Perfect for Bridal Showers, Weddings and more. Chocolate is the SWEETEST favor and is sure to be a hit at your party!